Even though sometimes it feels as if I'm nonexistent, I still love this hobby of blogging of mine- even more than painting sometimes. Why? Well, because there are so many awesome things about it. 1. Being able to express myself. The good, the bad, the ugly, and everything in between has been shared in my space and I wouldn't change a thing. I can express myself, my feelings and wants, and no one judges my for it (mostly because I moderate my comments, but still). 2. The community and friendship. Through blogging I have made more friends than I have in real life (no, I'm not a hermit) and those relationships have extend into emails, snail mail, friend requests on FB, advice and so much more. It feels good to know that I can email someone to bounce ideas off of or just to talk when I'm having a crap day. 3. The flourish of creativity. To be a blogger, there has to be some small bit if creativity inside of you. Through blogging, I have been able to sharpen my Photoshop and picture taking/editing skills, and even had the desire and drive to open my Etsy shop. 4. The following. Every time I receive the notification of a new follower on any of my social media channels, I get all giddy inside. It feels good to know that my stats are growing and more people are out there reading what I have to say. 5. Pin & insta fame. I seriously never knew that like 20 some strangers would like a photo of my Starbucks... or a wine glass design. It's crazy! But if you put alot of time and energy into blogging, you can become one of those lucky bloggers that rise to fame through various social media channels. 6. The money. Excuse me while I burst out laughing! If I was in it for the money, I would have quit sometimes ago. But it still makes the list because through blogging, there are ways to make money blogging. 7. The merchandise. I love how companies will send you free products, and all they expect back is a sponsored review. I have loved 90% of the products I have received, but in the end, I am being extra careful not to start just a sponsored post blog. 8. The love. Blogging is about community and love. I absolutely love how everyone supports one another and offers constructive criticism. 9. Snail mail. Blogger box swaps are the best! I love signing up, getting to know a fellow blogger, and getting a present, even though it's not my birthday. 10. Frequent trips to Target because you know, blogging essentials. The dollar section, the pens, backgrounds for photos, planners, more wine and everything in between, Target is like a blogger's heaven. And it's pretty too! I have loved the new people I have gotten to know! Great list, and I agree wtih all of them! I think the most unexpected favorite part is the friendships I've made! 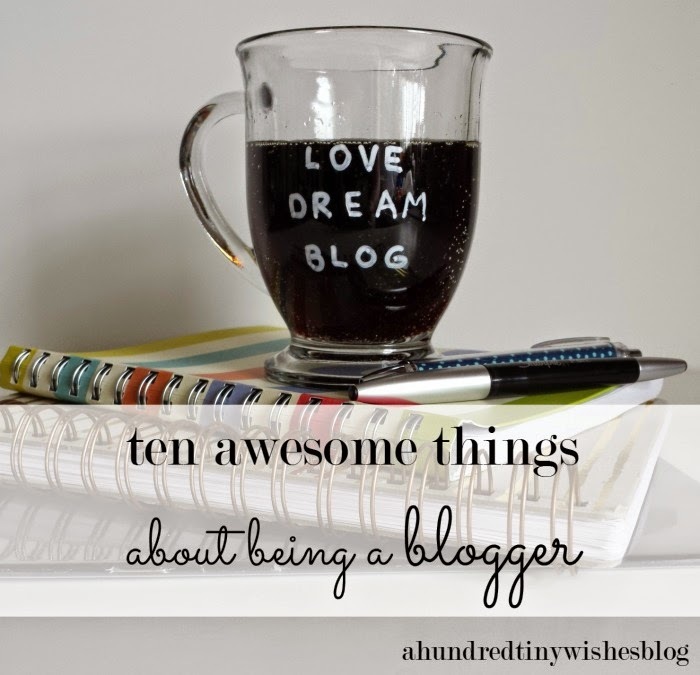 These are great reasons for being a blogger. This past weekend I was explaining blogging to my non-blogging friends and I couldn't help but laugh at myself as I tried to explain how much I care for my blogging friends (even though I've never met them). I still feel close to you and a few others. I'm glad you are finding time to blog even with working all the time now. amen to #10! :) I swear I am there a few times a week. Hey I'm extra non existent. I love it too! Lol Sometimes its just hard... I would love to post five days a week, but I just can't. But I also really love blogging! Oh man, Target is a hard habit to kick! There is just so much you "need"! It's crazy- I think I have friends in like every state in the US and some countries in Europe, all from blogging and getting to know them.